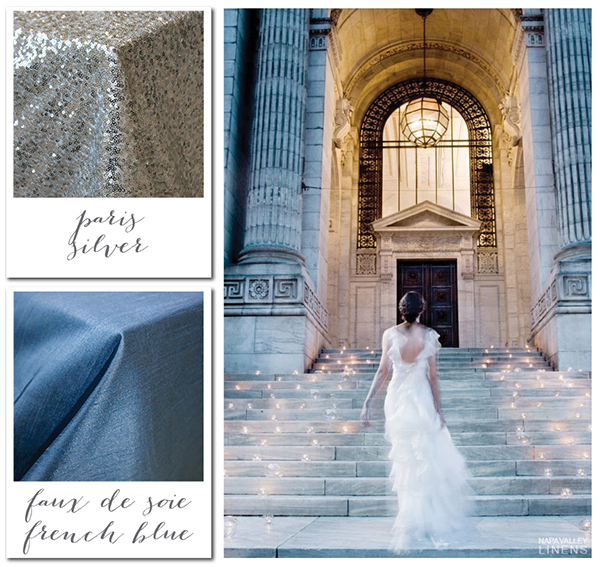 Inspiration boards, design concepts, and fun, unexpected ways to incorporate our linens into any event! Someone once told me that most blogs have an audience of two: the blogger and the blogger’s mother. 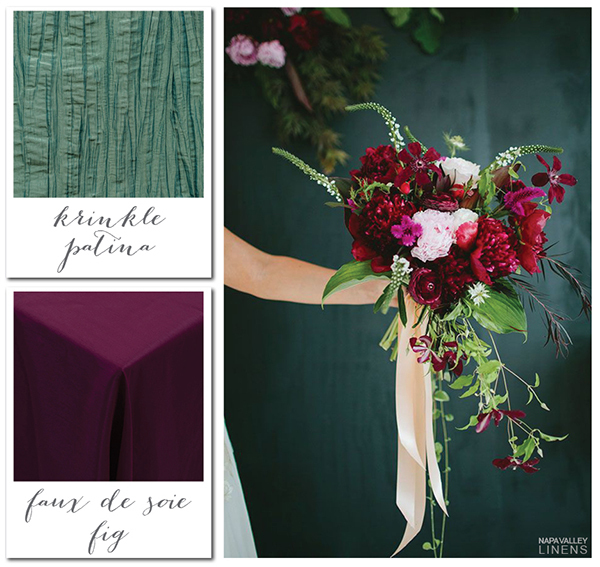 In the interest of keeping you interested, I’m going to feature a lot of pretty photos from real weddings and events, as well as fabrics that continually inspire me. 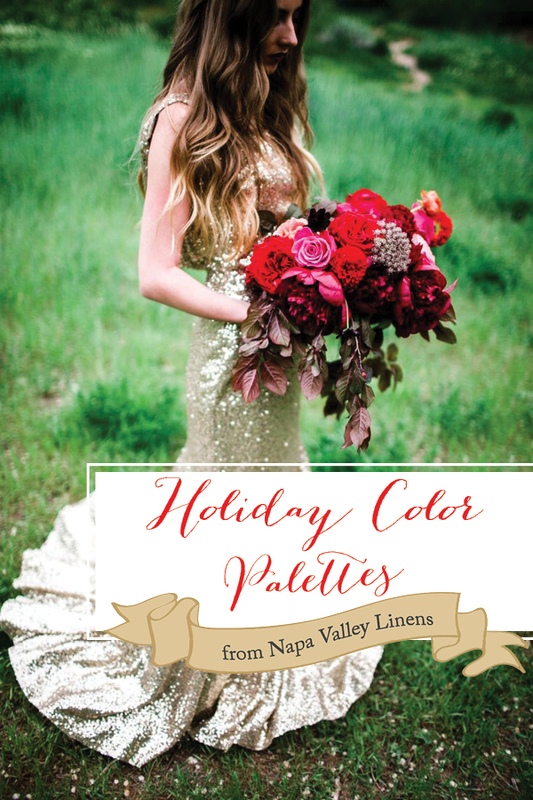 I will share the colors and patterns that are trending and how I know that to be true. 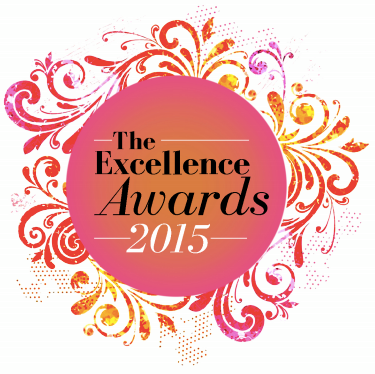 I will explain where trends come from. 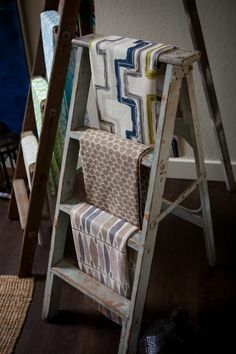 I will share what I look for in a fabric before committing to it and explain the critical element I always look for in a fabric, “the story”. If the fabric doesn’t have one, then it doesn’t make the cut! 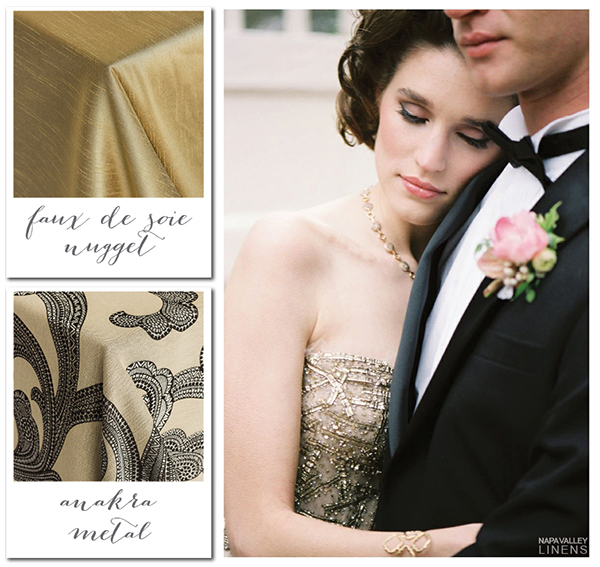 So let’s kick this off with a new fabric that we love at NV Linens. 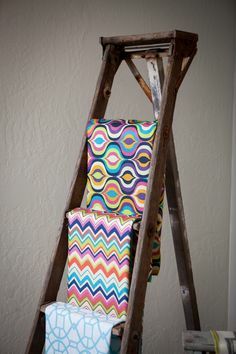 This fabric has a great story. As soon as I saw it, I knew it would have tons of appeal. 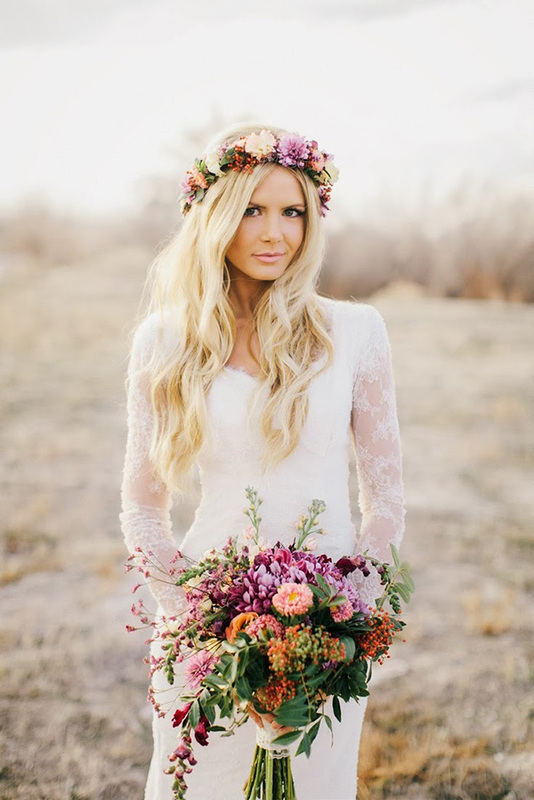 It has a defined style and yet, the style changes dramatically according to the color. It’s called Brighton. 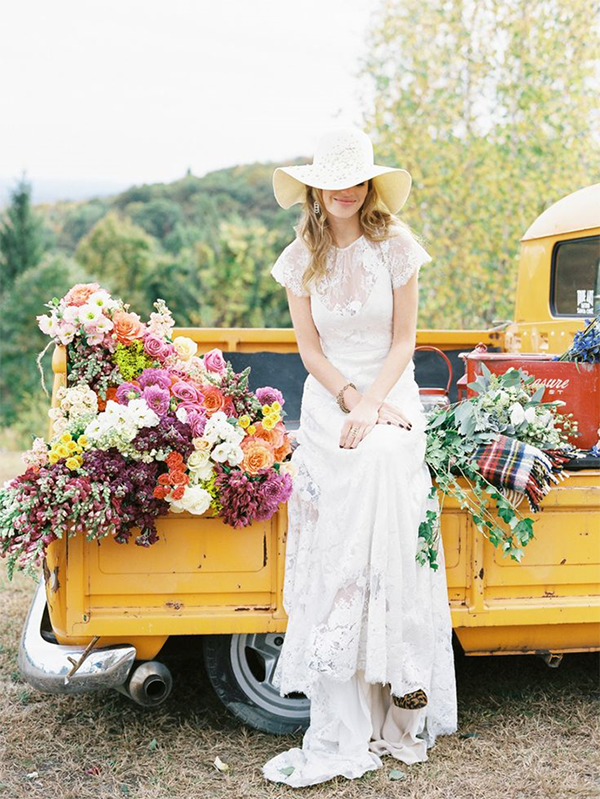 The story – Boho Chic. It’s been forty-five years since Woodstock and the age of Aquarius and everything late 60’s and early seventies is having a renaissance. 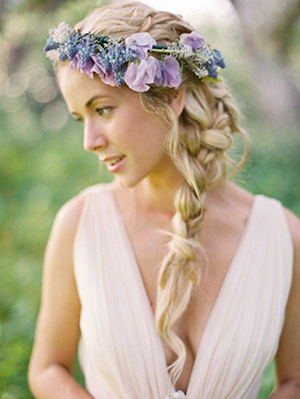 This linen is for the flower child, the barefoot bride with flowers in her hair. Outdoors, yes! Farm to table, yes! Biodynamic, organic, vegan, yes! Recycled, slightly worn, yes! 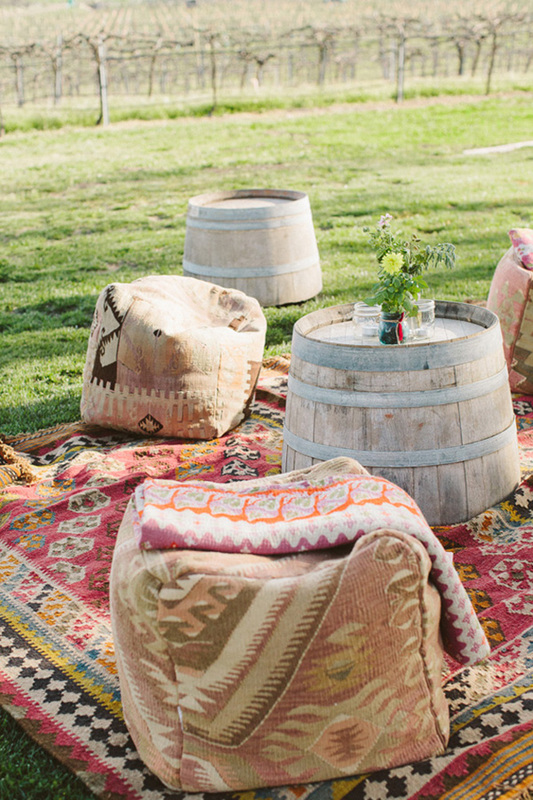 This linen has it all. Anything from this era will be popular for 2015, except for tie-dyes. I don’t miss them, do you? 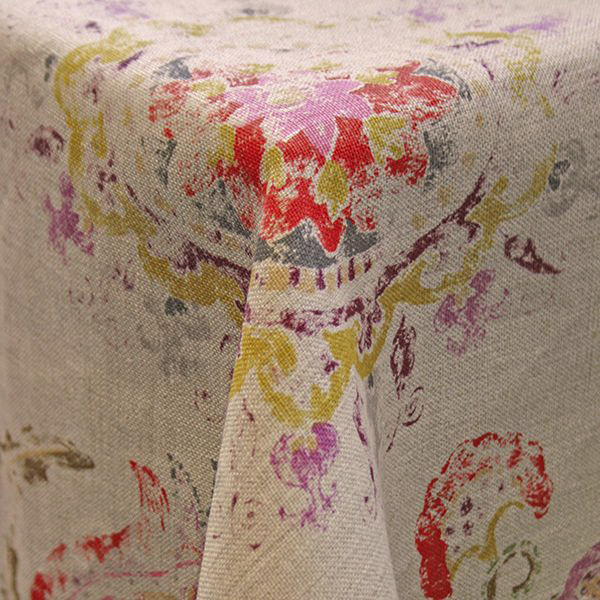 There’s a new printing process that creates a distressed look on fabric. I’m crazy about it. 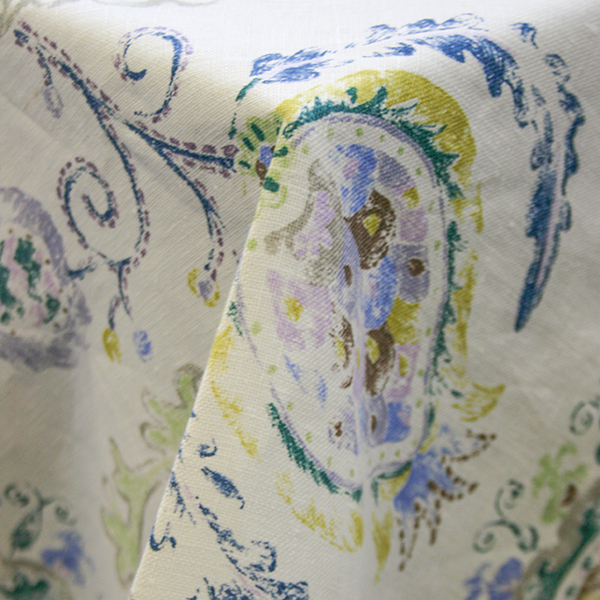 Some describe it as faded or antiqued, but the soft, blurry lines of the pattern keep it relaxed and soothing. That can’t possibly be the same pattern, you think; but it is, only in shades of blue, periwinkle, purple and green. 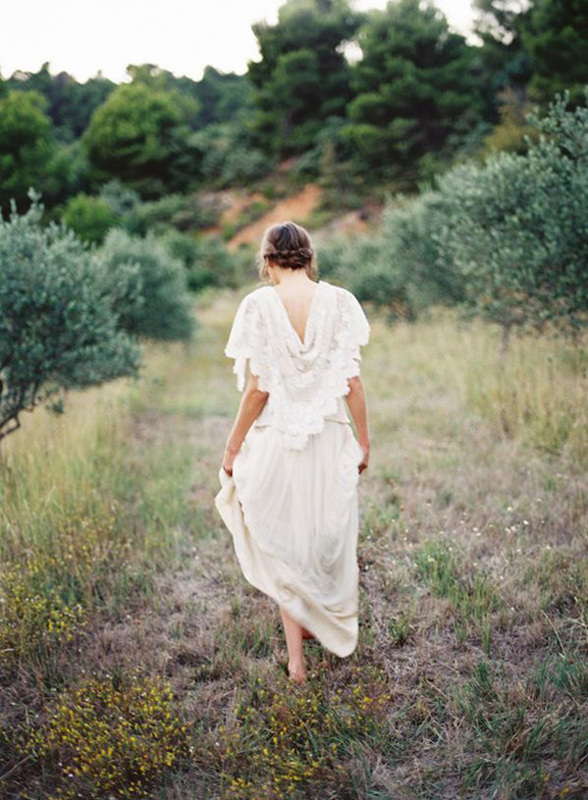 The ivory background is in crisp contrast to the pattern and it makes everything feel fresh and dreamy. It has the watercolor quality of a Monet painting. 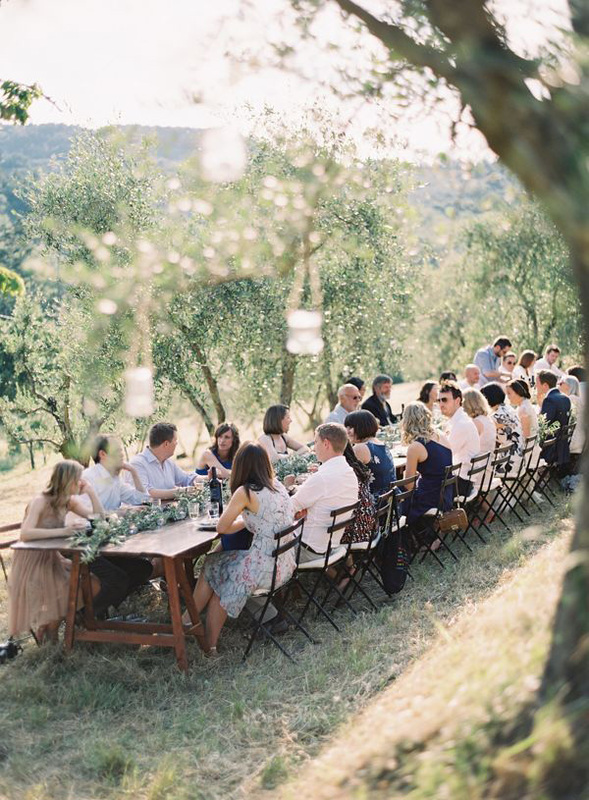 I’m feeling South of France or Italy, or an al fresco luncheon in a grove of olive trees or under a pergola of wisteria. 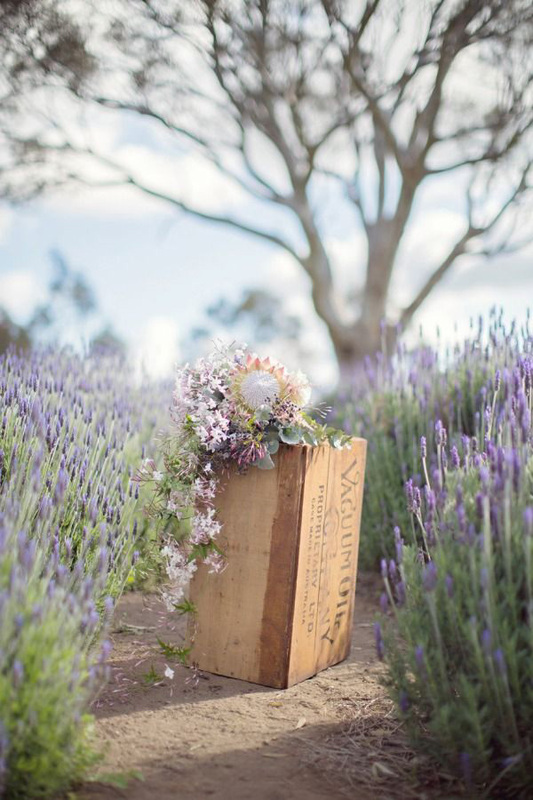 Bunches of lavender are tied with satin ribbons that rest in big wicker baskets. 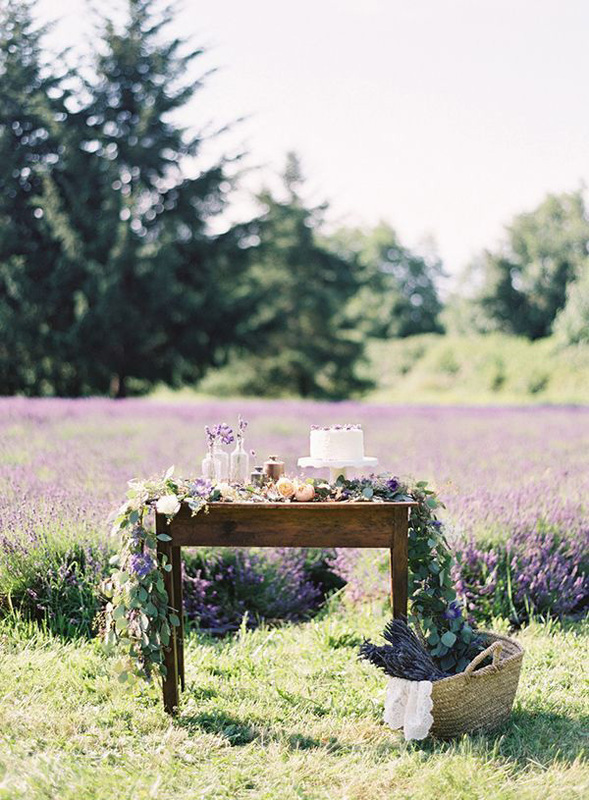 The table is set with blue and white hydrangea, or bushels of lilacs and trailing white clematis. Can you see it? That’s called story. 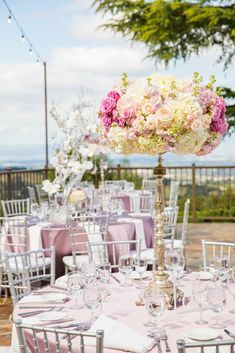 Whether you opt for a simple, elegant cake with fresh flowers or a modern, graphic dessert, your wedding cake table is sure to be one of the focal points of your reception! 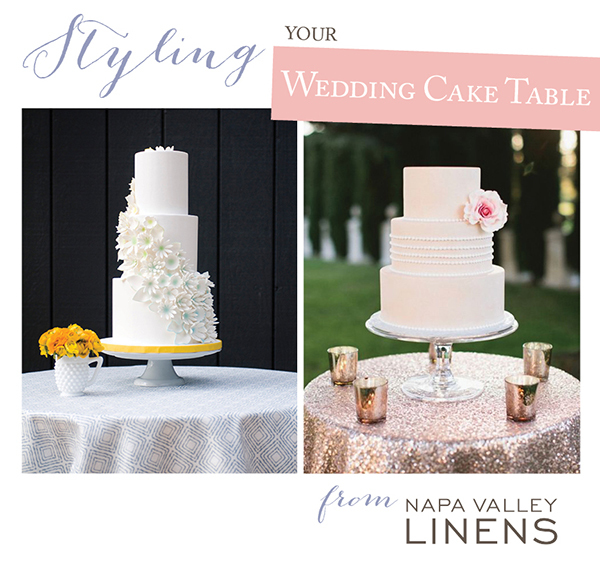 Styling the wedding cake table is one of the easiest ways to bring a unique and personal touch to your wedding – we’ve paired some of our favorite cakes with just the right linens to complement them and complete the overall look. 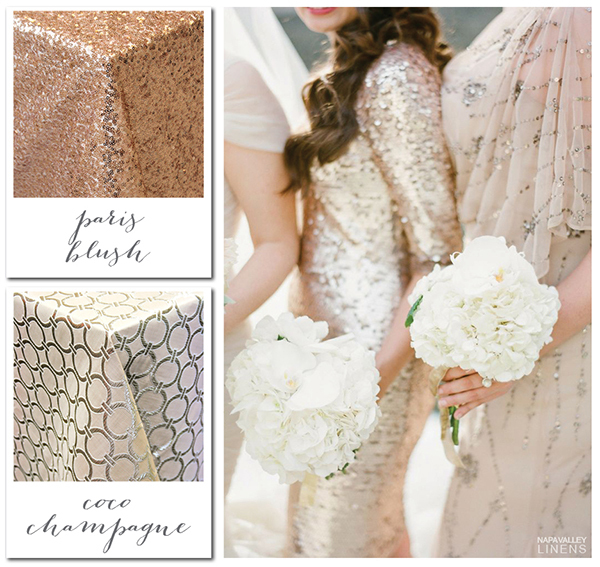 A minimalist wedding cake takes on a modern look when paired with a small geometric print, while a delicate tiered confection can take on a glam look when set on top of sparkling sequins. 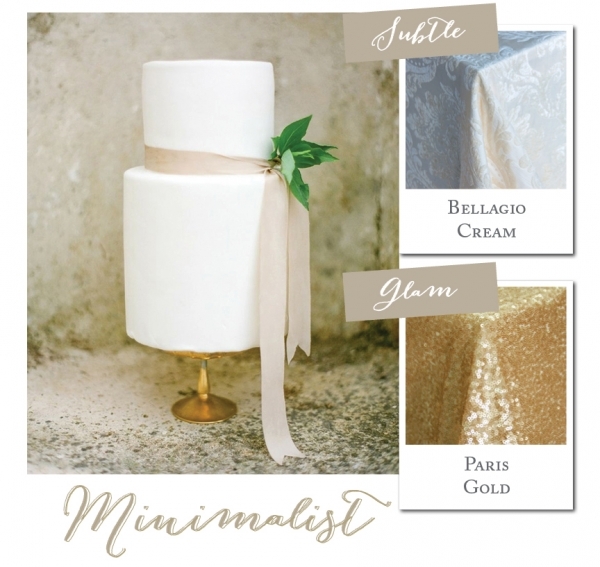 Combining just the right print or linen texture with your cake design can have an enormous impact on the look and feel of your reception, so read on to find out just how linens and cake can create a perfect pairing! 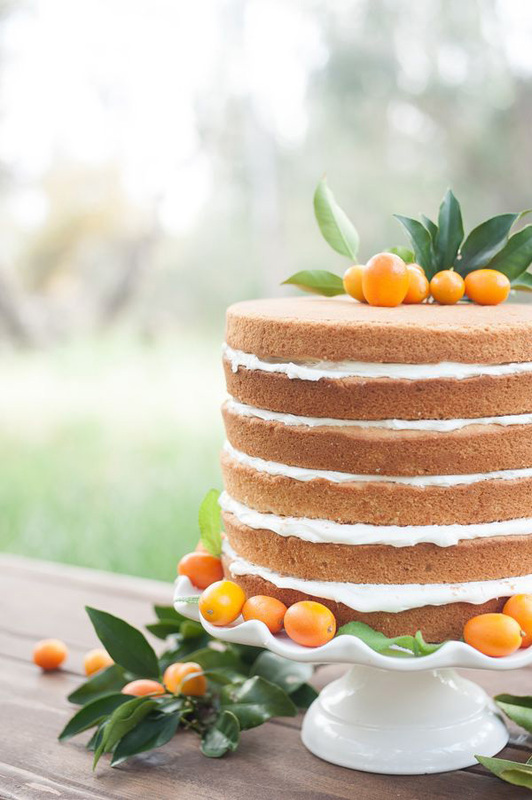 Naked cakes are still taking the wedding world by storm and this one could not be more romantic! The light crumb coat of frosting beautifully ties in with today’s rustic craze, while the peach roses and gold topper add a romantic finishing touch. 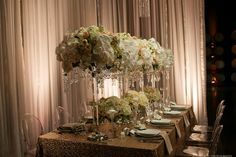 The simplicity of the cake itself leaves lots of room to play with table linens when it comes to pattern and texture. The ivory and pale peach combination doesn’t call for vivid colors in the tabletop styling but an elegant neutral pattern would complement the soft colors in the cake itself. 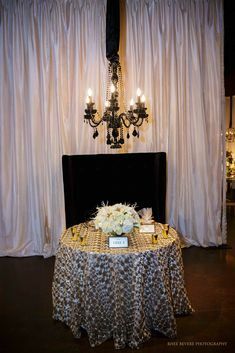 The large-scale damask print of our Brussels adds an elegant note to the unfinished cake, while the tone on tone palette complements it without pulling focus. 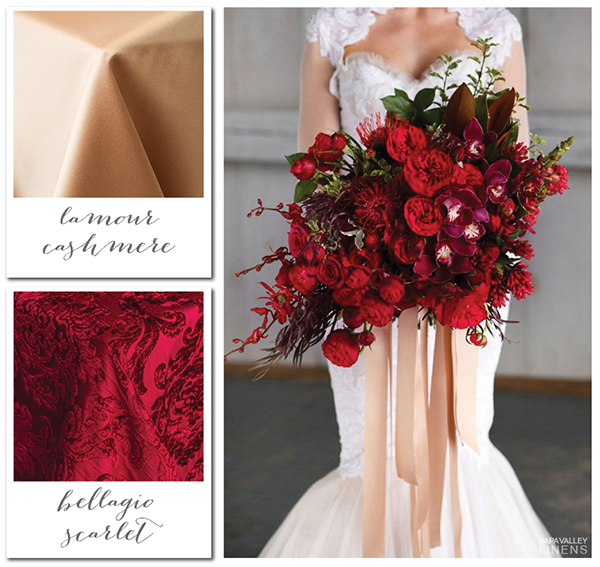 The unabashedly romantic chiffon rosettes of our Boheme Creme Overlay tie in with the delicate florals and add beautiful texture! 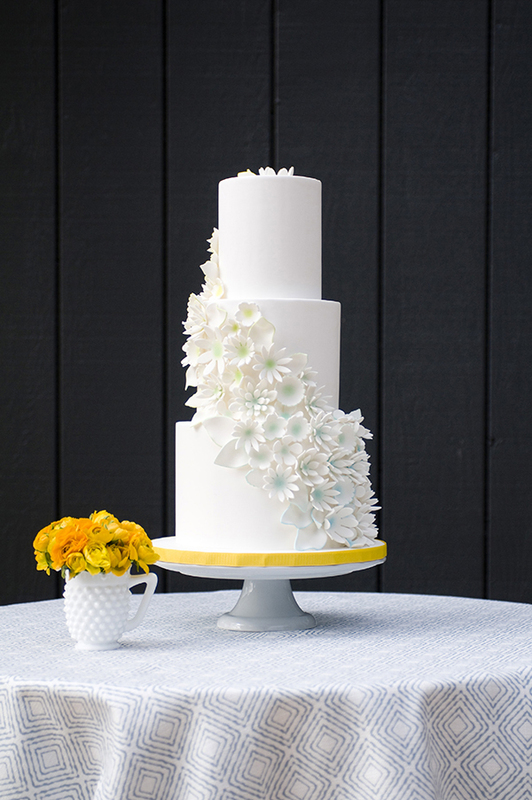 Sometimes simplicity is the best way to make a statement – elegant, minimalist cakes have become a beautiful trend! 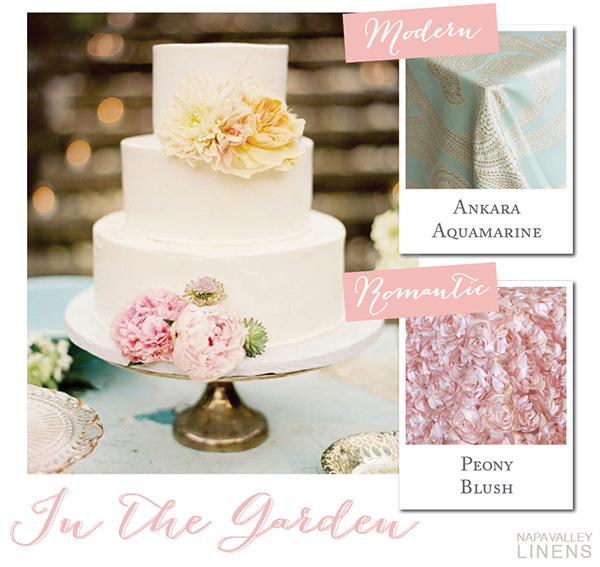 Smooth fondant columns or barely swirled buttercream layers look delectable but not overwhelming, leaving a lot of options when it comes to picking linens. 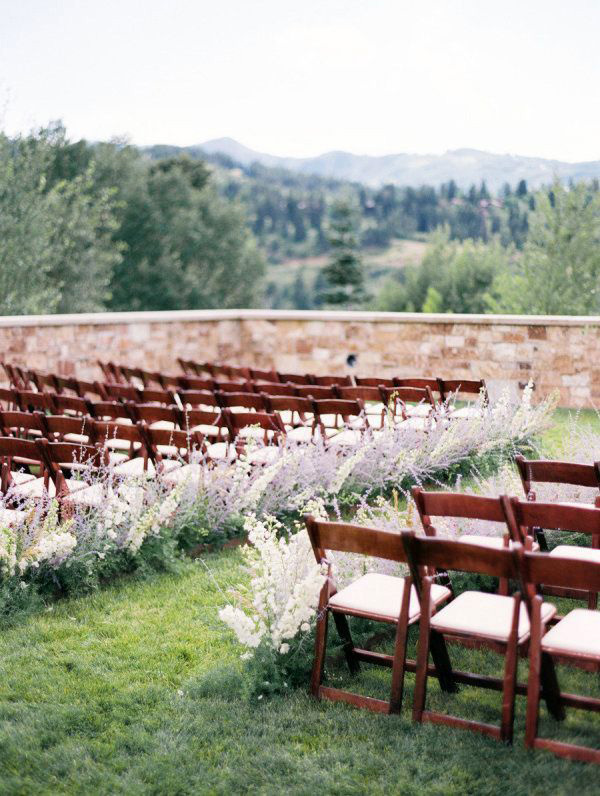 Make a gentle impact with a selection of simple cakes in varying sizes and heights to create visual interest, tying them together with accent details and, of course, the linen! 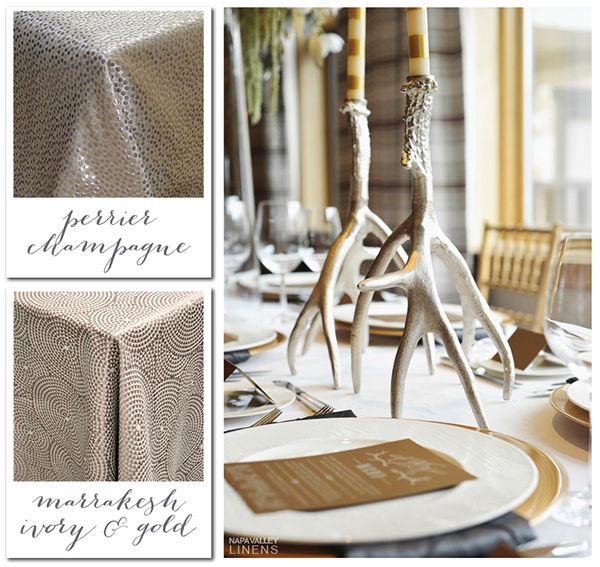 The subtle pattern on our richly textured Bellagio Cream linen adds depth to the table while the matte sparkle of our Paris Gold sequins adds a glamorous touch while remaining understated. 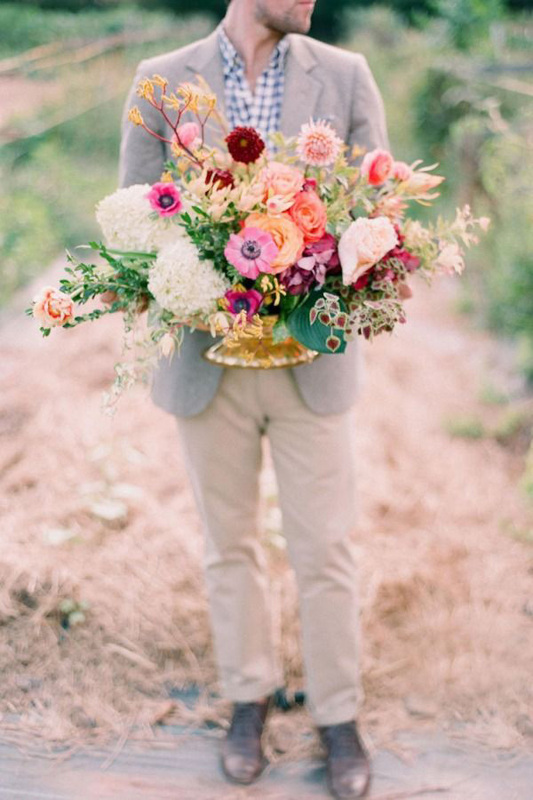 There’s nothing like fresh flowers on a cake, and this sweet, pastel palette is perfect for a garden wedding! Our swirling Ankara print in soft Aquamarine (Sharon’s favorite color!) adds a modern vibe to a petite cake table or a grand dessert display. 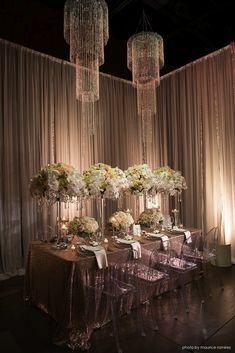 The large-scale pattern adds a modern flair, but the delicate color palette helps it blend with a softer garden palette. 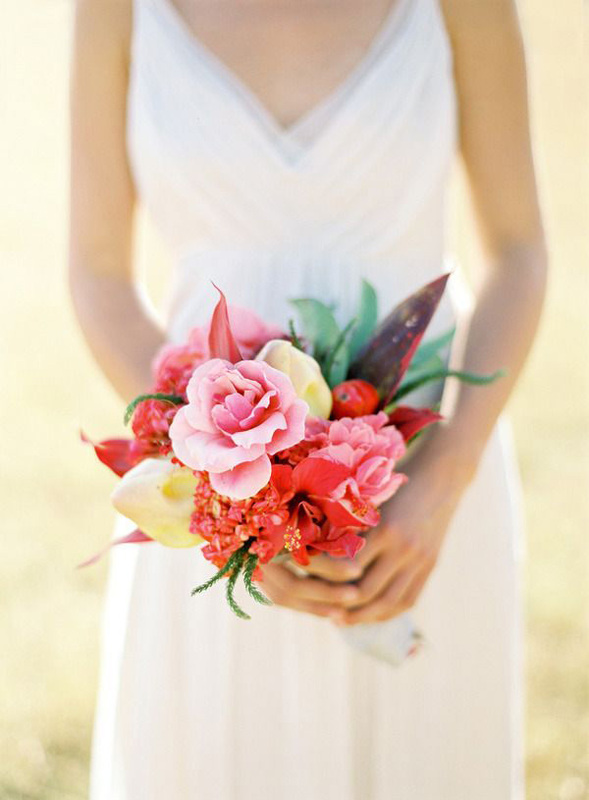 Our Peony Overlay in Blush or Ivory carries the floral theme with a beautiful, textural petal design! 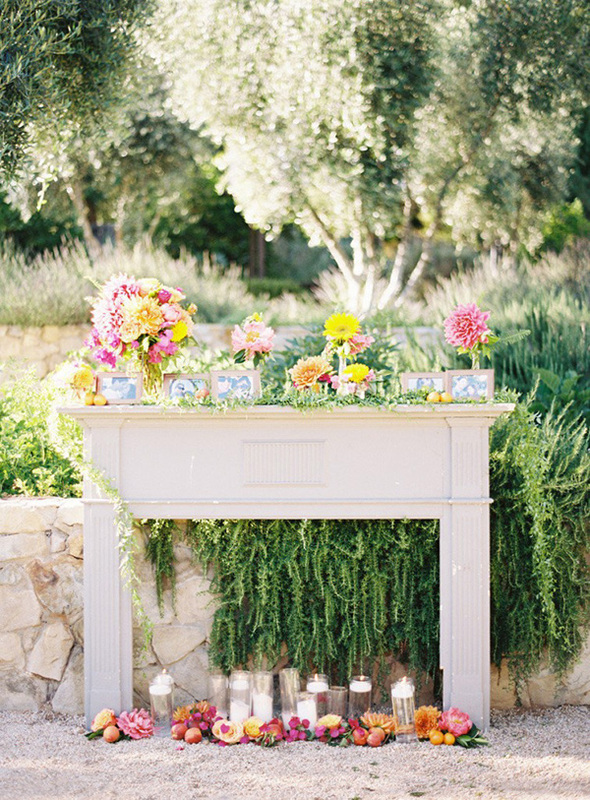 Lots of couples are opting for a dessert buffet or elaborate display these days and we love the options it creates! 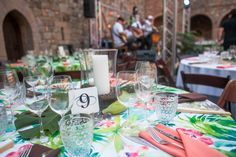 Multiple platters and stands add a lot of different elements to a table, so it’s important to pick just the right linen to have an impact without overwhelming the table. 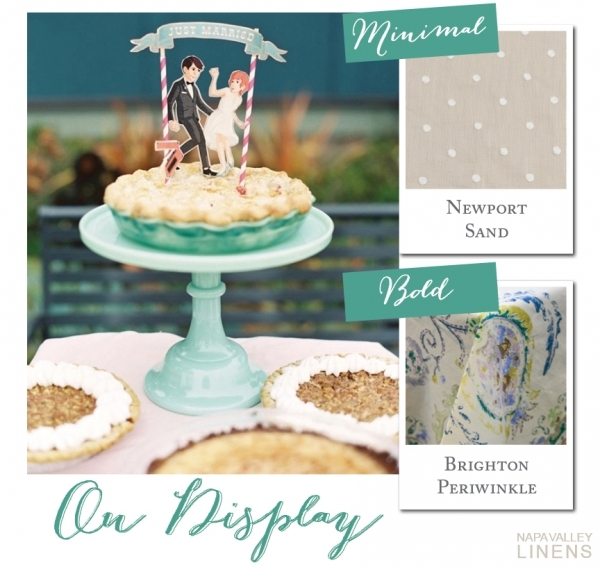 Newport Sand has a lovely natural texture and petite polka dots to lend just a little bit of design, while our soft, distressed Brighton print adds color and pattern but is large enough to keep from looking busy with the rest of the decor. 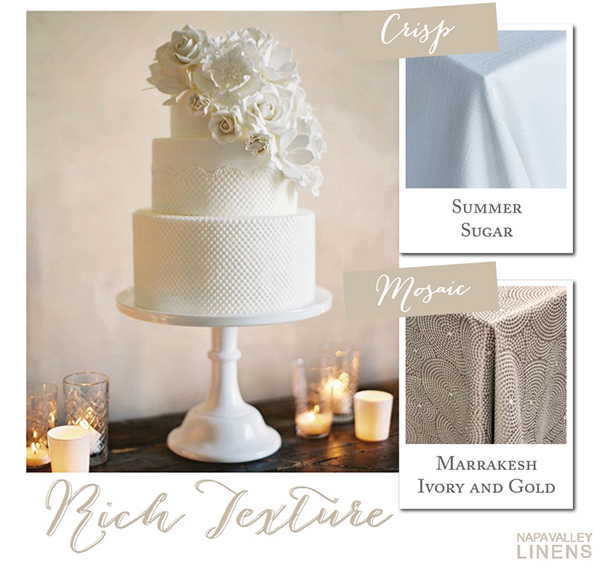 Textural cakes will always be one of our favorites – they remain a classic for lovers of elegant wedding design. 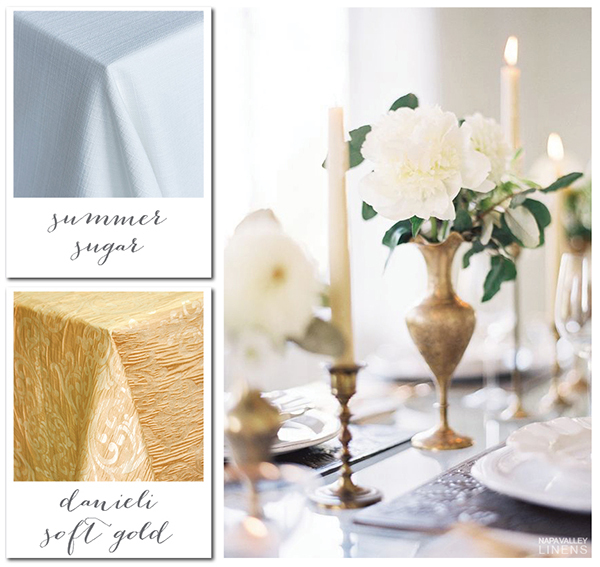 Our Summer Sugar is thick and luxurious to the touch, with a woven look that adds depth to the table while still appearing chic and crisp. 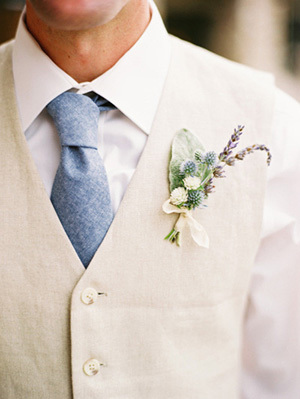 The simplicity of the linen ties into the texture of the cake while carrying the minimalist vibe. 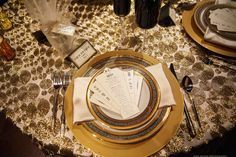 A small, repeating pattern like our Marrakesh adds a gorgeous design element while the matte gold on ivory remains effortlessly chic! 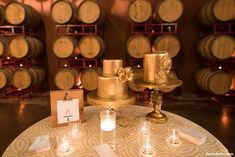 It’s no secret that we love a metallic and gold and silver look amazing on a cake! 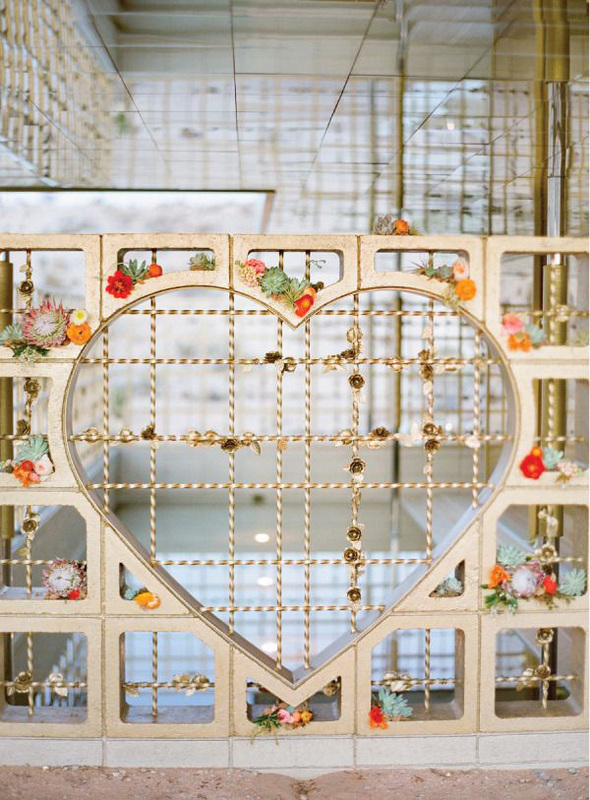 Whether your style is all out gold glam or just a hint of metallic, there’s a gorgeous way to tie that edible art into your cake table design. 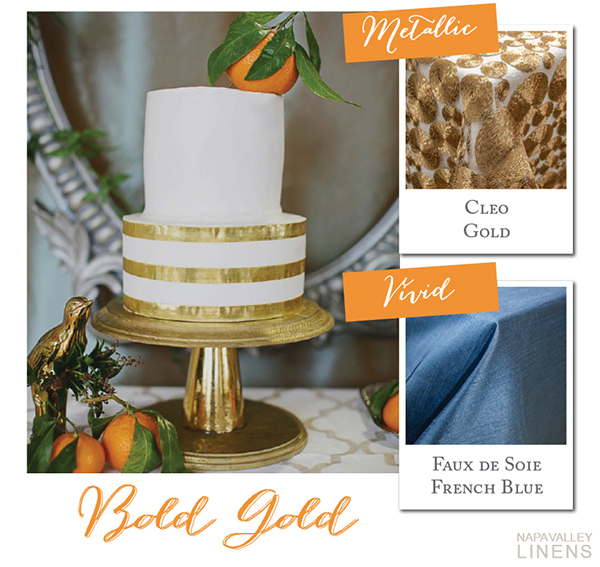 The bold metallic of our Cleo Gold Overlay is sure to make a statement, whether the cake atop it is romantic Art Deco or just a hint of gold leaf. 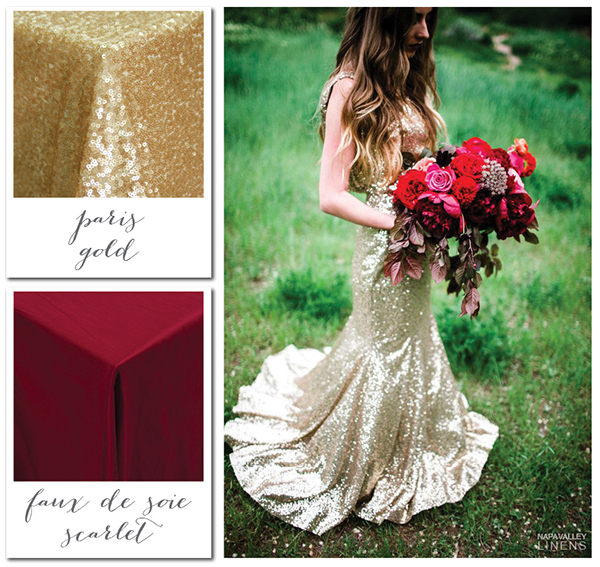 If edible sequins or gold dust buttercream is your style, the vibrant hues of our Faux de Soie collection play off a dramatic cake with rich color and a luxe Dupioni silk texture! 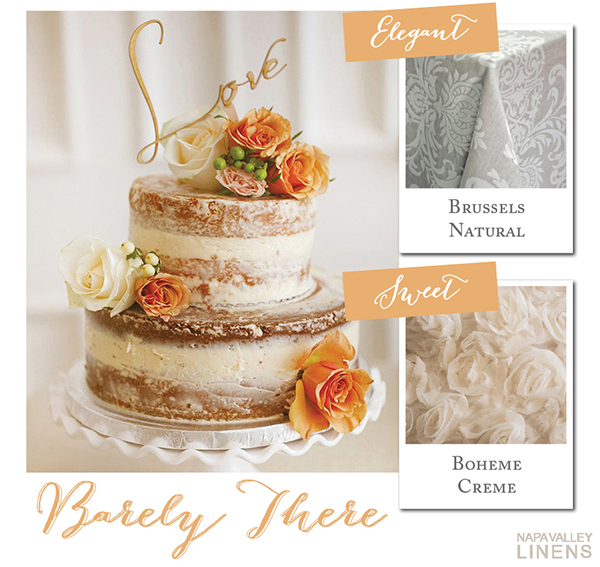 What linens would you pair with your perfect cake! 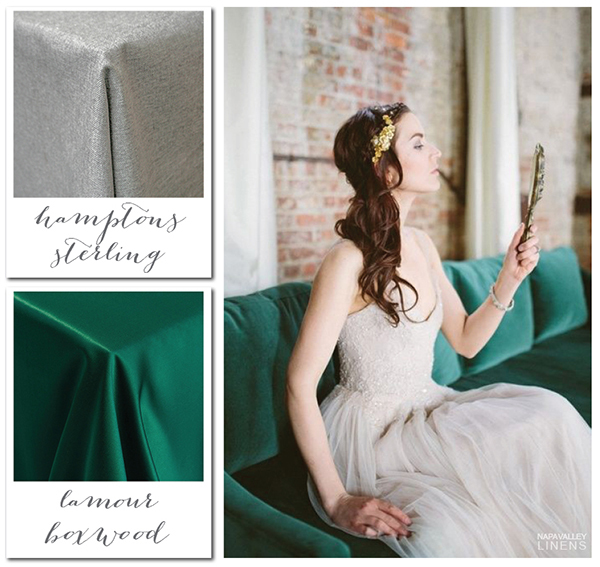 Take a look through the album of our favorite cakes, or check out these fabulous linens and the rest of our collection on our Website!